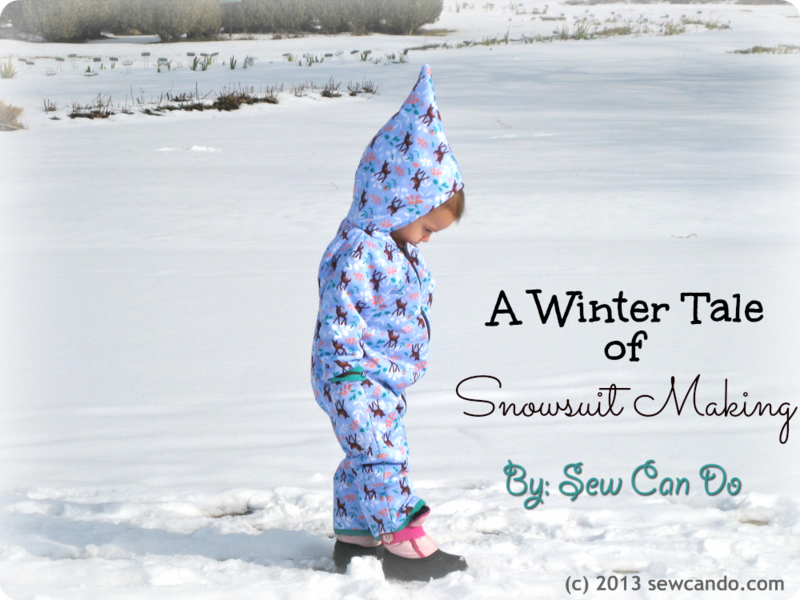 For the past two winters my little lady wore a snuggly fleece bunting that we loved. It kept her warm and covered up in our harsh Michigan winters. Yet try as I might, it was nearly impossible to find something similar now that she is a 3T. And forget fully waterproof for playing out in the snow (which she was itching to do this year). The few I found were for serious ski folks and around $100, and neither of those fits this mom's lifestyle. Since I'd had such success with my DIY Snow Pants, I thought about how I could modify that concept to make what I wanted: a one-piece, zip up snowsuit that could have a built-in hood and mittens. Oh, and it had to be made at a price I could handle (under $35). And I figured it out! First I had my sweetie try on the too-small bunting we had. That gave me a starting point for the piece shapes and determining how much extra room was needed (slightly longer torso, legs and sleeves, widened middle, etc.). Then I flattened and traced each of the sections (back, sleeves, hood, front & zipper flap) and used my handy french curve ruler to re-draft larger versions onto tracing stabilizer and added in seam allowances. Using those I cut the necessary pieces from some micro fleece for the lining, thermal fabric (the stuff used in hot pads) for the insulator and PUL for the waterproof outer. 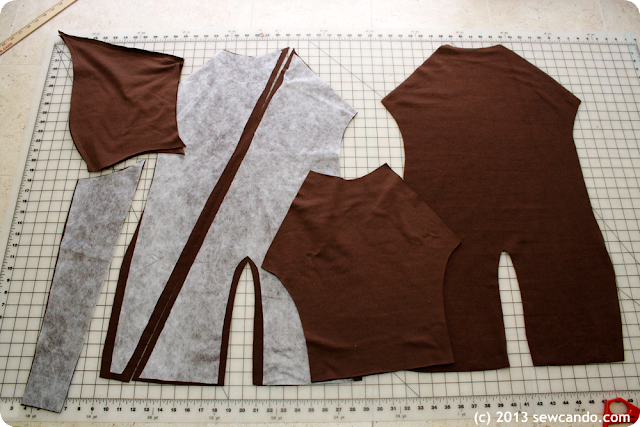 I kept the thermal & outer fabrics layered together and started sewing up the zippered front pieces. Then added on the fronts of the raglan sleeves, followed by sewing those to the back and, last of all, sewing on the hood. I repeated all that with the lining, but left a gap in the side. I sewed both inner & outer together along the front & hood, pulled it right side out and sewed the gap closed by hand. And the coordinating mittens (tutorial for those here) were made from the leftover fabric. Being on a string looped through the sleeves ensures that they never get lost and the overlap between the sleeves and mitten tops means no snow sneaking in. It took a bit of time to figure things out as I went, but it felt great to have it all come together and really work. I really love the fabric print & it's unusual color combo - it's so much cuter than the pink-on-pink coats that seem to be the only girly look in the stores these days. We've gotten so many compliments on it when we've been out and people look stunned when I thank them and say I made it! She wasn't even phased when she got snow on her face! 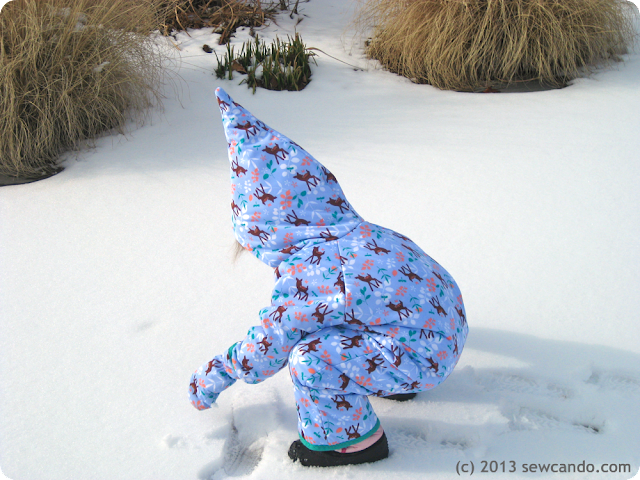 The snowsuit keeps her cuddly & dry everywhere else, so she can frolic away like a little polar bear. And it brings a huge smile to my face seeing her running around in it. Definitely worth the effort! Oh WOW! That is so amazing and so cute! You wouldn't by any chance be willing to share that pattern, would you? 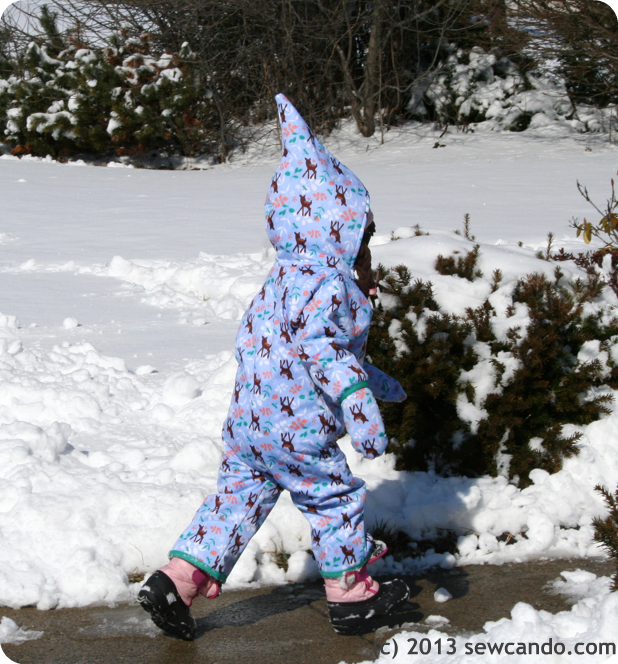 I'll be needing one of those next winter for my then 2,5 years old, but I don't have an example to trace from... (We're in Cali now, but moving back to Quebec...) Also, that PUL is adorable, where did you find it? Do they have boy prints too? Thanks Mriekje. It's much to large to try to make into a digital file or to include basic directions - it would take more time than I have right now to draft into a full on pattern. You might have some luck finding one at a thrift store this time of year (when everyone is getting rid of worn out ones). 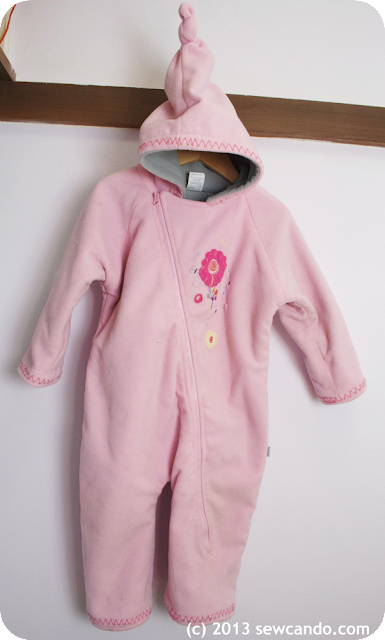 Or just putting together a hooded top and pants and tracing around them as if they were one piece. I get my favorite PUL prints from http://www.diapersewingsupplies.com/pul-fabric-prints/. Loads of great prints for boys and girls - it's also where I got the alien & 101 Dalmatian fabric for my boys' snow pants. That's ok, I just figured it wouldn't hurt asking... ;-) The idea of putting top & pants together is not that crazy... :-) I have a couple of months to think about that one..! That is all sorts of adorable! I'd love if you'd come link this in my my How To Tuesday link party! Thanks for the invite Katie - will do! This is adorable and you are so talented!! I love the string loop. So smart! We always loose gloves. Thanks do much for linking!! We do too - this year I wanted to be sure we'd always find them and it's working great! 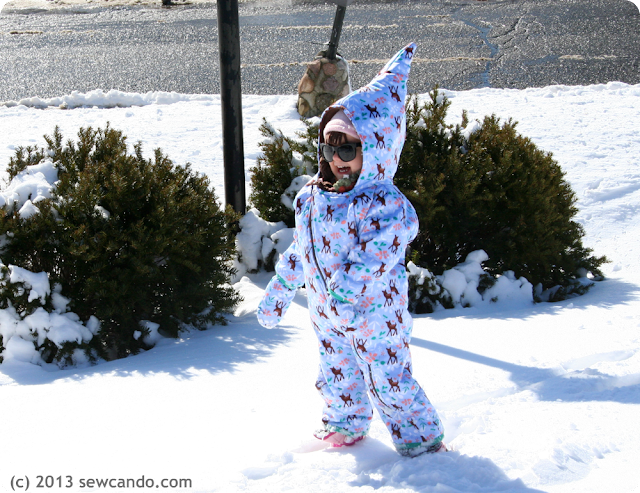 Cute snowsuit! You were clever to find a way to use the old one to make a new larger one! Nice sewing job, too. Thanks so much Noreen. It definitely wasn't a novice level project, so I was proud I pulled it off! 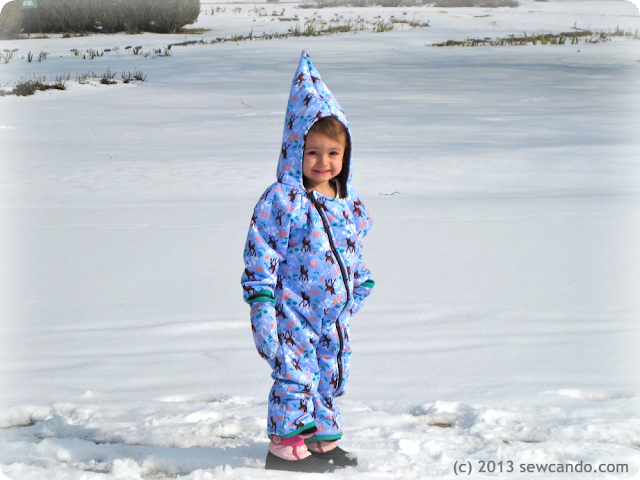 Your cute little model looks delighted to be in her sweet and cozy snowsuit. 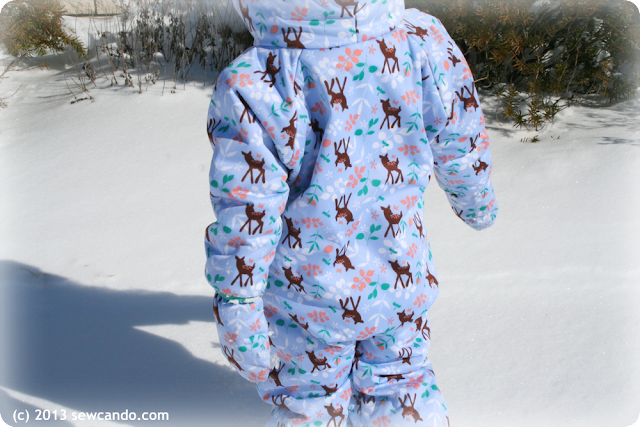 I love the reindeer fabric! I love the fabric too - I knew I had to do something fun with it and it's a lot easier getting her into it because she likes it. This is absolutly adorable! Way to go. Love it! The hoodie is my favorite part! Too adorable. Some of the fondest memories I have from childhood are wearing clothes my mom made for me. Your daughter looks like she loves her snowsuit. Nicely done! I feel that way too - I remember loving all the crocheted sweaters & matching caps my great-grandmother made and all the costumes my grandma & mom did. My kids seem just as excited when something is made just for them, so it keeps me sewing! It was TOTALLY worth the effort, this is the cutest snow suit I have ever seen. I love that the mittens match, are not going to get lost, and have that overlap to keep the dreaded cold off of little fingers! I'm visiting today from Thursday's Favorite Things and I'm your latest follower. This turned out just wonderful. It is too cute for words, as is your little girl. Love the fabric you used and the elf looking hood. This is adorable. I would love to make something similar for my daughter. I've only ever used PUL for making diapers. I wouldn't have thought it would be durable enough for outerwear. How does it hold up to the wear and tear of kids? 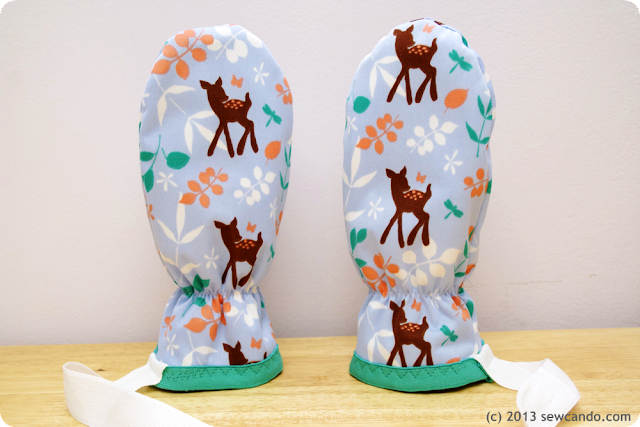 I started branching out with PUL and it is SO versatile! 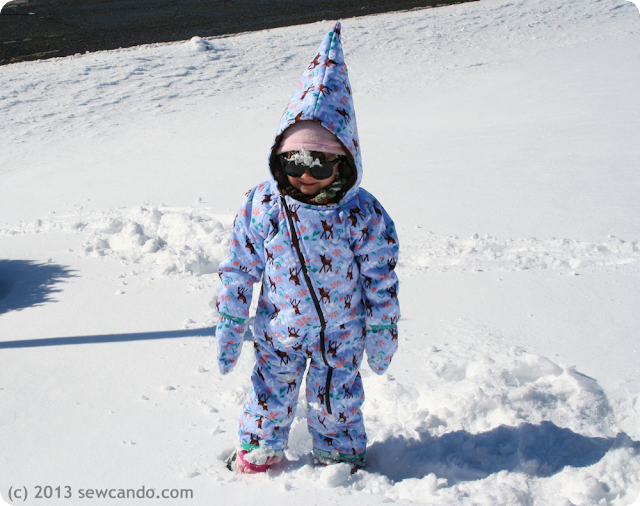 I've done bags, mittens, snow pants for my active boys and now this snowsuit. It wears incredibly well - my daughter even rubbed her mitten on the driveway where there was some oil stains (the very first time she wore them too) and it came right out. Highly recommend it! The baby and snowsuit are just adorable. I admire your talent I have wanted to sew forever and just could never get the hang of it. Lovely! Doreen I couldn't sew a lick 5 years ago - I just told myself I was going to give it a try and not give up and I never looked back. Definitely give it a chance - you'll probably surprise yourself! this is pretty darn amazing! Good job! What a cute and clever project! PUL is much more versatile and durable than people realize. You've really taken it to the next level with this project. Thanks for the post and sharing your creativity. She is a doll baby!! What a sweet face! You have done a marvelous job. You saw a need and made something wonderful out of it!! I know your daughter will have many happy and warm play times ahed of her. Thank you so much for sharing it with us for the party! AMAZING! I would have loved this tutorial last winter when the boys were smaller, you did a great job. 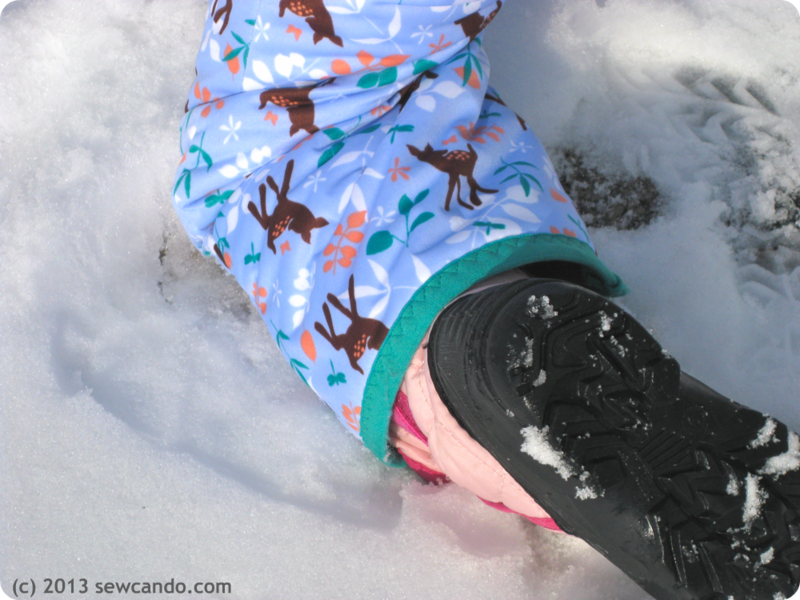 I am definately trying your snowpants (I may even start in the middle of summer, because yes, Michigan is so unpredictable!). OMGoodness...this is so creative and cute. I wish I had the ability to make something like this...I'm so impressed. Wow! That is really cute! It definitely takes some patience do make that. Impressive! This is awesome!! I love it! Please consider linky up to our first ever Pattern Party! Only those with free patterns to share are invited to link. Please check it out! OMG! I love that second last picture TOO Much! This is hands down the cutest thing I have ever seen!! That is some seriously impressive sewing! Thank you for the tip on the source of PUL and the fold-over elastic! I'm looking online for PUL fabric but don't see the cute patterns I was hoping to find. Where do you shop?